Full ratings and breakdown’s, including week-to-week comparisons, and individual program analysis, etc., follows after the jump. CBS finished in first place for the evening with a 7.5/12 household rating/share, 12.10 million viewers and a 3.1/8 rating/share among adults 18-49. 4:55 p.m.: NCAA Men’s Basketball Tournament: UNC vs. Oklahoma (6.8/13 HH rating/share, 10.84M viewers, 3.7/13 A18-49 rating/share). 7:18 p.m.: 60 Minutes (9.0/15 HH rating/share, 14.44M viewers, 3.4/10 A18-49 rating/share). 8:18 p.m.: The Amazing Race (7.1/11 HH rating/share, 11.99M viewers, 3.7/9 A18-49 rating/share). 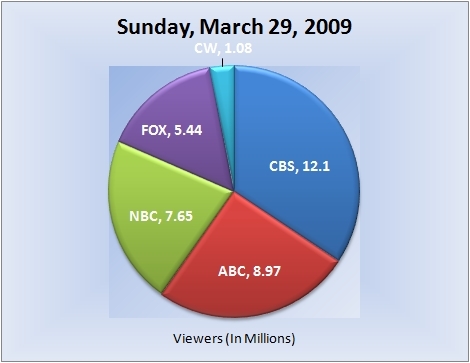 9:18 p.m.: Cold Case (7.4/11 HH rating/share, 11.86M viewers, 2.6/6 A18-49 rating/share). 10:18 p.m.: The Unit (5.9/10 HH rating/share, 9.46M viewers, 2.4/7 A18-49 rating/share). ABC followed in second place for the evening with a 5.5/9 household rating/share, 8.97 million viewers and a 2.8/7 rating/share among adults 18-49. 7:00 p.m.: America’s Funniest Home Videos (4.6/8 HH rating/share, 8.14M viewers, 2.3/7 A18-49 rating/share) was not at all affected by the Basketball coverage on CBS or the Golf coverage on NBC. The program improved by double-digits across the board, showing most promise among adults 18-49 (+21%) and viewers (+14%/+1.02M). 8:00 p.m.: A two-hour edition of Extreme Makeover: Home Edition (6.6/10 HH rating/share, 10.79M viewers, 3.5/9 A18-49 rating/share) performed better than usual, mostly on the addition of the final hour. Overall, the show was up nearly 900,000 viewers and 9% among adults 18-49 from the week prior. 10:00 p.m.: Desperate Housewives-REPEAT (4.1/7 HH rating/share, 6.14M viewers, 2.1/6 A18-49 rating/share). NBC finished in third place for the evening with a 4.9/8 household rating/share and 7.65 million viewers, but was fourth among adults 18-49 with a 2.5/7 rating/share. 2:30 p.m: Bayhill Invitational Golf Tournament (4.4/9 HH rating/share, 6.70M viewers, 1.5/5 A18-49 rating/share). 8:00 p.m: In its third week on the air, Kings (3.0/5 HH rating/share, 4.51M viewers, 1.3/3 A18-49 rating/share) has stabilized, but that’s not really good news. Two straight weeks at below 5 million viewers, and an anemic 1.3 A18-49 rating doesn’t bode well for the future of the series. Sorry fellow fans! 9:00 p.m: Celebrity Apprentice (5.5/9 HH rating/share, 8.66M viewers, 3.3/8 A18-49 rating/share), meanwhile, managed solid week-to-week gains, improving by double-digits among households and viewers (+17%/+1.27M) and among adults 18-49 (10%). FOX followed in fourth place for the evening with a 3.2/5 household rating/share and 5.44 million viewers, but managed a third place finish among adults 18-49 with 2.6/7 rating/share. 7:00 p.m.: American Dad-REPEAT (1.5/3 HH rating/share, 2.38M viewers, 1.1/3 A18-49 rating/share). 7:30 p.m.: King of the Hill-REPEAT (1.8/3 HH rating/share, 2.98M viewers, 1.4/4 A18-49 rating/share). 8:30 p.m.: …The Simpsons-REPEAT (3.7/6 HH rating/share, 6.50M viewers, 3.1/8 A18-49 rating/share) that really surprised. The episode had full 100% retention among households and adults 18-49 and near-100% retention among viewers (99%). It improved upon last week’s time slot occupant King of the Hill by an impressive 19% in the demo. This is a very good performance for a repeat. 9:00 p.m.: With a better than usual lead-in, and sparked by cameo appearances by the entire Star Trek: TNG cast, Family Guy (4.8/7 HH rating/share, 8.20M viewers, 4.2/10 A18-49 rating/share) drew its largest audience since November. The show shot up by double digits among both viewers and adults 18-49 and more impressively, was the night’s most-watched program among adults 18-49. 9:30 p.m.: American Dad (3.5/5 HH rating/share, 5.99M viewers, 3.0/7 A18-49 rating/share) was flat from the week prior. Retention levels were so-so at around the 70% range. The CW was left in fifth place with a 0.8/1 household rating/share, 1.08 million viewers and a 0.4/1 rating/share among adults 18-49. 7:00 p.m.: Jericho-REPEAT (0.5/1 HH rating/share, 721,000 viewers, 0.3/1 A18-49 rating/share). 8:00 p.m.: Movie: WarGames-REPEAT (0.9/1 HH rating/share, 1.27M viewers, 0.4/1 A18-49 rating/share). Note: Network average numbers from the week prior are based on fast national data. Comparison’s from the week prior (or episode-to-episode, etc.) on specific shows are based on final national data. Ratings for the current day are based on fast nationals. (Expect all three scenarios to be the case at all times, unless otherwise noted). The final rating for first-run episodes that aired this evening will be reported the following week. So for example, the final rating for tonight’s episode of “60 Minutes” will be reported in next weeks report for Sunday, April 5, 2009. Also keep in mind that because these are fast affiliate numbers, when the finals are released there may be noticeable changes.